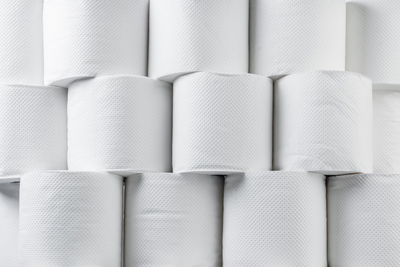 When a tissue manufacturer was struggling with the performance and reliability of the chain drive feeding tissue logs into an accumulator it turned to Tsubaki for help in reducing the lost production time. Using its RetroFit service to fit a high performance, lubrication-free Lambda chain on the machine, Tsubaki provided a solution that increased availability, improved product quality, reduced maintenance costs and increased productivity. Tsubaki engineers recommended replacing the existing chain with a high quality, high performance RS16B Lambda chain. The operating environment within a tissue manufacturing plant is likely to be dust- laden, so conventional lubricating oils will soak up some of the dust, leading to blocked lubrication paths. With oil not penetrating as expected, increased levels of wear is experienced, which increases maintenance costs whilst reducing productivity and efficiency. Ultimately premature chain failure is almost guaranteed if the lubrication regime is inadequate. This was the problem experienced at the tissue paper converting company, and it was particularly prevalent on a log saw accumulator where large logs of wound tissue paper collect before being cut to size by high speed rotating blades. Further, contamination of the chain was leading to it losing flexibility, which often led to the logs being presented to the chain badly so that the cutting was out of position. It also caused uneven wear on the chains, which in turn heightened the problem. The result of this was that the accumulator 'crashed' frequently, meaning that production time was lost and reactive maintenance had to be undertaken. There was a further effect in that some of the tissue became contaminated and had to be scrapped. Obviously, there was room for improvement and Tsubaki was called in because of its considerable experience and expertise in the paper industry. It has worked on projects from the initial woodchip operations right through to the finished paper roll. As one of the world's premier manufacturers of power transmission products, Tsubaki has developed a comprehensive portfolio of reliable products, specifically designed to meet the tough working environment of the paper and pulp industry. From drive chain and sprockets to couplings and gearboxes Tsubaki can supply a wide range of power transmission products and offer related expertise; ensuring improved operations and leading to increased productivity and profitability. Assessing the operation of the log saw accumulator, Tsubaki engineers recommended replacing the existing chain with a high quality, high performance RS16B Lambda chain. This incorporates oil-impregnated sintered bushes in each link which act with a special coating on the link pins to provide long term self-lubrication for free movement and flexure, reliability, reduced wear and a long operating life. Lambda chain can lead to significant reductions in operating cost. The longer life means less frequent replacement, saving not only the cost of a new chain, but also the loss of revenue associated with machine stoppage for the replacement operation. There is also less maintenance, which, again, leads to less cost and fewer stoppages. When the Lambda chain was fitted to the log saw accumulator, the tissue company saw immediate improvements on several fronts. For instance, the self-lubrication meant the chain remained flexible and free running. 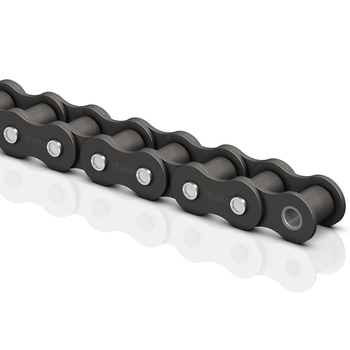 The parallel drive chains benefited from Tsubaki's 'Match and Tag' service, which guarantees a maximum length difference of no more than 0.5mm, no matter how long the chain. This means that the logs are always correctly aligned when entering the saw, so they are cut accurately and there are fewer rejects. With no need for additional lubrication, there are cost savings and the elimination of contamination problems, with the chain surface always dry and clean. The accumulator, too, is now running clean, eliminating the quality problems associated with contaminated product and preventing the dust-related wear that was causing the machine itself to crash. With its RetroFit service, Tsubaki is able to replace chain in almost any application and this often leads to immediate savings, improved productivity and ultimately reduced cost of ownership. The log saw accumulator is just one example of how Tsubaki can use specialist knowledge, experience and advanced products to create a wide range of performance improvements in diverse industries and sectors.